These cute Admit One open card invitations were made with a combination of different techiques and resources including basic paper crafting (folding and cutting) and the use of digital elements. For those of you that don't know a digital element is, it's simply a design created with computer software that computer savvy crafters can print on to card or paper to use in their crafting projects. They would be great to use for a baby shower or birthday party or any other celebration event you have in mind. Cut patterned paper or plain cardstock to the desired size you want. 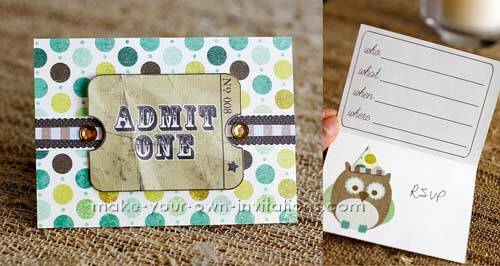 Print the invitation info (Journal Stamp) on one side of the card then fold. Adhere the owl sticker to the bottom half of the card. Create a simple party hat by cutting a small triangle piece patterned paper. Adhere the hat to the top of the owls head. I used Photoshop to create the ticket on the front of the card, but you can use whatever editing/creating software you may have. I opened the ticket element (Journal Stamp), filled in a color, and typed in the numbers and star. I applied a distressed overlay (Weathered Overlays) and added the wording "ADMIT ONE" (Remember When Alphas). Print and cut out the tickets. On the front of the invitation, I cut patterned paper and adhered it to the front. I added two strips of patterned paper across the middle of the front, placed the ticket on top with pop dots, and added gems.